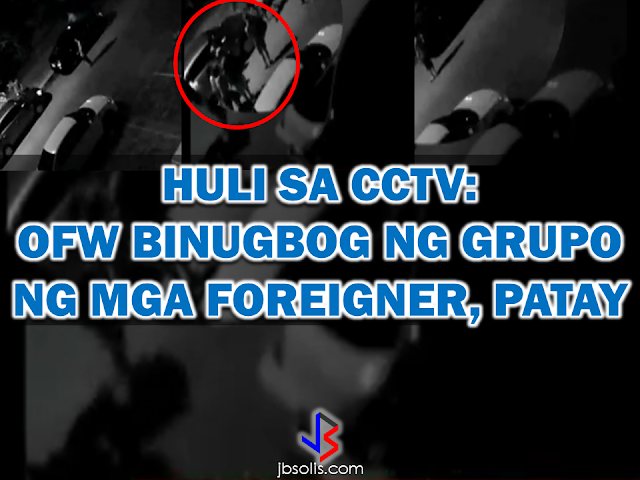 A resident named "Lola Nene" said in an ABS-CBN exclusive interview, that they had been awaken by loud shouting from the outside saying "tama na". After a few minutes, some guys came and helped the victim to try to get up. They carried the victim and brought it to the nearest hospital using a parked car in the area but the victim died in the hospital sooner. Lola Nene said that the mob that attacked the victim cannot be less than 10 people and are all foreigners, probably Chinese nationals. The authorities are collecting more CCTV footages that may lead to the arrest of the suspects and to determine what may be the cause of the problem that led to the beating of the victim to death. UPDATE: Suspects identified by the police. The report said the main suspect, Fritz Mohamed, was identified through the help of footage from CCTV cameras in the area. Three other suspects Cyril Rada, Earl Grande and one alias Jammil were also identified, the report said. Six more companions , two male and four female have yet to be identified.